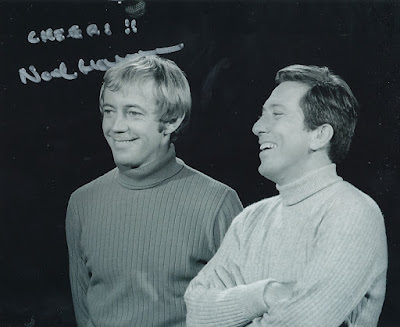 Noel Harrison appeared twice on the Andy Williams Show, first on December 11, 1966 and then again on February 19,1967. Unfortunately, neither of the episodes have been released on DVD although both are available on bootleg DVDs. Noel sang his single, In a Dusty Old Room, on the December 11, 1966 edition of the Andy Williams Show. The song is about a dead child, but for the Andy Williams Show, the lyrics were altered from the fairly depressing 'the child is dead', to the slightly more upbeat 'the child has fled'. After singing In a Dusty Old Room, Noel performed a duet of his song, The Future Mrs Awkins, with Andy Williams. He had released his version of the music hall song as the b-side to his 1965 single, A Young Girl. 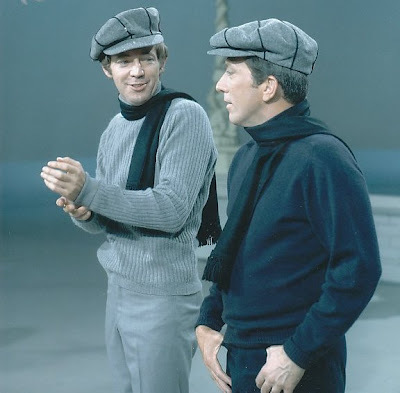 Before performing the duet, Harrison and Williams also talk about Noel's role in The Girl From U.N.C.L.E. TV show. This film from the February 19, 1967 edition of the Andy Williams Show is the only existing live footage of Noel singing his single, Out for the Day. The 1967 single was very popular in America on its release and reached the top of the charts in a number of cities.